"Medicare HI trust fund", "Medicare", "PPACA Implementation", "PPACA", "health reform"
On August 5, the Social Security and Medicare Trustee Report was issued for 2010. In this post, I plan on talking about the report's implications for Medicare, and the saving grace of the health reform law passed this year (the Affordable Care Act or ACA) on it. It's important both to understand how Medicare plans to keep its promise to seniors, and also to understand the positive effects of health reform, since the 24 hour news cycle is bereft of depth on policy. In contrast with the 2017 fund exhaustion date reported last year, the ACA is expected to result in much smaller HI deficits for the next several years, followed by small annual surpluses through the remainder of the short-range period, which postpones trust fund exhaustion to 2029. Why was addressing Medicare so important? 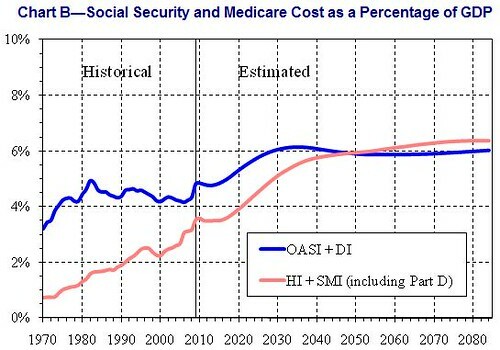 Because with an aging population and with it the cost of their health care needs, cost of Medicare is expected to surpass that of Social Security before 2050, even with the reforms in place. So what has happened, and how has the ACA affected Medicare's life? 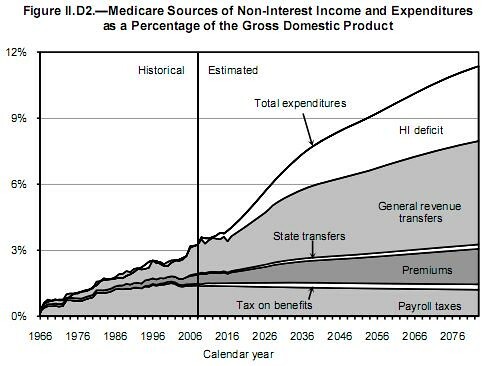 Medicare’s HI Trust Fund has a projected 75-year actuarial deficit equal to 0.66 percent of taxable payroll under the intermediate assumptions, a large improvement from the 3.88 percent figure reported last year. That change is largely attributable to the ACA, which mandates a reduction in the growth in Medicare payment rates for most health service providers, reduces payments to Medicare Advantage plans, and imposes higher HI payroll taxes for high earners. Those factors slow the depletion of HI Trust Fund assets and delay the anticipated fund exhaustion date to 2029, 12 years later than reported last year. The actuarial deficit can be interpreted as the percentage points that could be either added to the current-law income rate or subtracted from the cost rate for each of the next 75 years to bring the funds into actuarial balance. In other words, absent health reform, Medicare payroll taxes would need to rise by almost 4% (or benefits cut by 4%) to keep Medicare in balance in the long run. After health reform, the increase in revenue needs to be a little more than a half per cent. Think about it this way: today, you and your employer each pay 1.45% of your income in Medicare taxes, for a total of 2.9%. Your Medicare taxes would need to be more than doubled - raised by 133% to be exact - without health reform, if you wanted Medicare to keep all its benefits and expenses and the cost was equally distributed. With health reform, if no additional savings were realized and if taxes had to be raised on everybody, that hike would be a mere 23%, or you and your employer would each pay 1.68%. That gap is now less a quarter of the size of what is collected in payroll taxes, making the problem far more manageable in the long term. It is very important that one understand the significance of the HI (Part A) deficit with respect to the payroll taxes. Medicare payroll taxes fund the trust fund, and by law, Medicare is prohibited from taking money from the general revenues to make up any shortfall in the Part A trust fund. General revenues and premium collected can be used for Part B (i.e. doctor visits and so on). 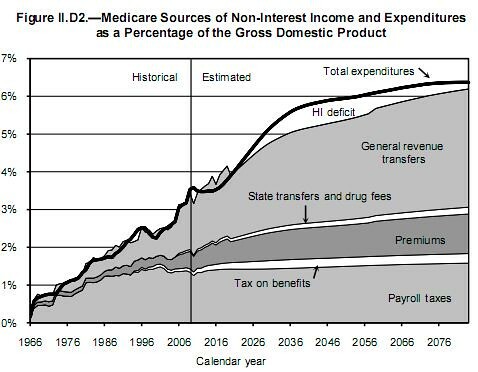 Note also that as a percentage of GDP, the cost of Medicare in the long term is down in the long term. Prior to the passage of health reform, Medicare was going bankrupt and being privatized at the same time. Thanks to the ironically named "Medicare Modernization Act of 2003" under President Bush, the government was paying 14% more to cover a beneficiary through the even more ironically named private "Medicare Advantage" plans than it would with traditional Medicare. In other words, the government was paying extra for the private insurers to privatize Medicare. ACA puts a stop to the overpayments. Last year, private insurers also jacked up Medicare Advantage premiums by another 14%, presenting the bill to taxpayers. Lest anyone think that the savings are artificially inflated because these reductions in payment to health service providers include the scheduled reduction to payments to doctors that Congress adjusts each year (commonly known as the "doc fix"), rest assured that is not the case. The doc fixes apply to physician compensation, not hospital procedure and are thus covered under Medicare Part B, the Supplementary Medical Insurance program, which is funded by incoming revenue from premiums paid by beneficiaries as well as general revenue. I don't know about you, but if a law extends the life the Medicare trust fund for an additional 12 years, I call that progressive. If a law rescues Medicare from a looming immediate financial emergency, I call that legislation progressive. If a law cuts the long term Medicare deficit by 83%, I call that law practical, great progressive achievement. If a law does all three, I call that a progressive triumph. Welcome to that progressive triumph. Welcome to the Patient Protection and Affordable Care Act of 2010.